The article contains two beautiful Sankey diagrams. The first depicts the global food system in 2011. Flows are shown as dry mass. Flows are not individually labelled with the underling quantity, but rather a scale at the bottom shows 5 representative flow quantities and their corresponding width. 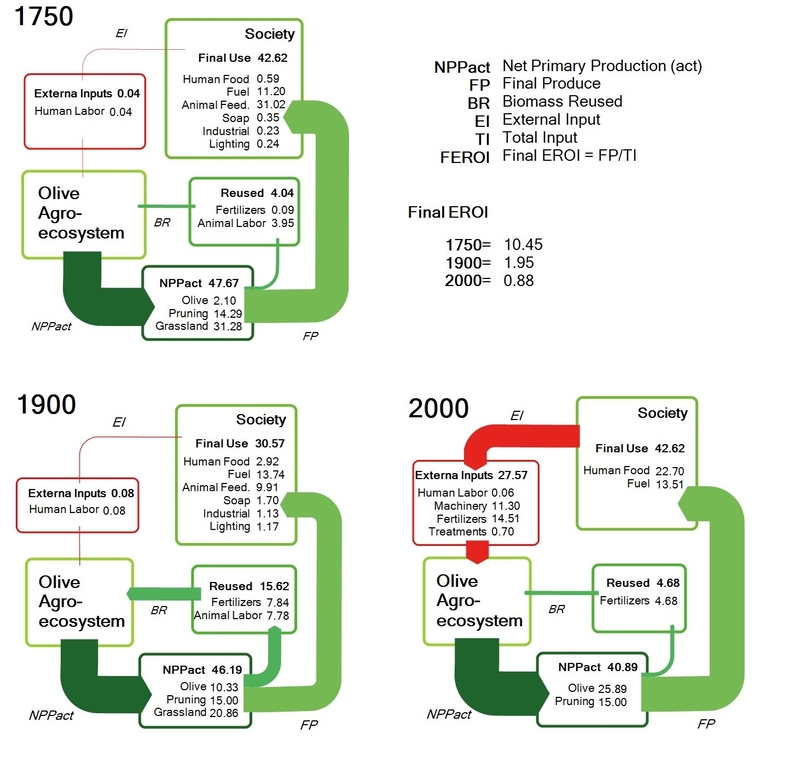 Crop (yellow) and grassland (green) net primary production (NPP) are shown as sources for the global food system. Losses are branching out as grey arrows. These “inefficiencies” of the system are described in detail in the article. The authors observe that “44% of harvested crops dry matter are lost prior to human consumption” and that “the highest loss rate can be found in livestock production”. The second Sankey diagram shows a section of the above figure, just the dry matter flows from crop harvest and processing, without any losses. This is interesting because it allows us seeing the share of processed and non-processed food being consumed by humans worldwide, and the the share of crop-based food intake (dark blue) compared to animal-based food intake (red). You could call this the veggie / non-veggie split. Based on dry matter that is. 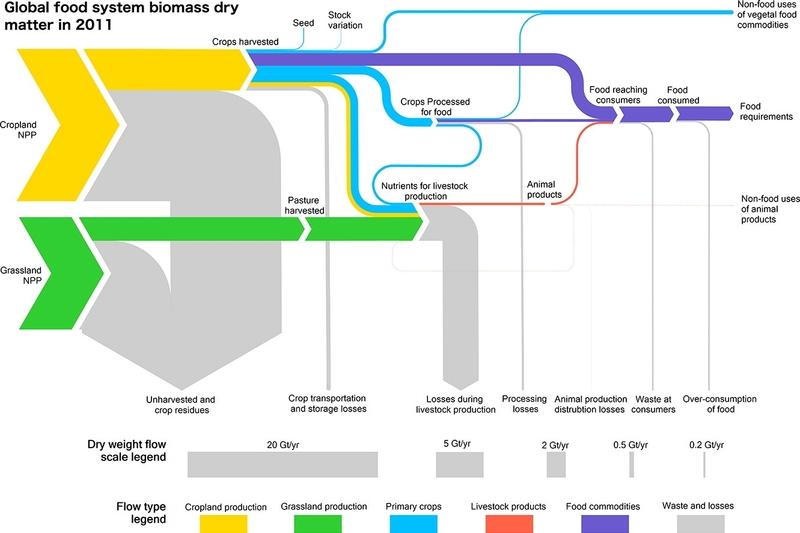 If you want to see the corresponding global food system wet mass, protein and energy Sankey diagrams check out this interesting article. A recommended read for all of us eaters. An article by Bachmaier, Hans; Effenberger, Mathias and Gronauer, Andreas in German agricultural technology publication ‘Landtechnik’ 65 (2010), no. 3, pp. 208-212 describes how “for ten agricultural biogas plants, a detailed balance of greenhouse gas emissions (GHG) and cumulated energy demand (CED) was calculated”. Both diagrams feature the GHG emission burdens in CO2-eq per kWh electric energy produced from biogas. Upstream chains for fertilizer, diesel and electricity taken into account too. Displaced GHG emissions nonus in green. It is interesting to see that in this agricultural energy scenario methane (CH4) and nitrous oxide (N2O) are contributing to climate change in the same dimension as carbon dioxide. Back after a short later summer break. 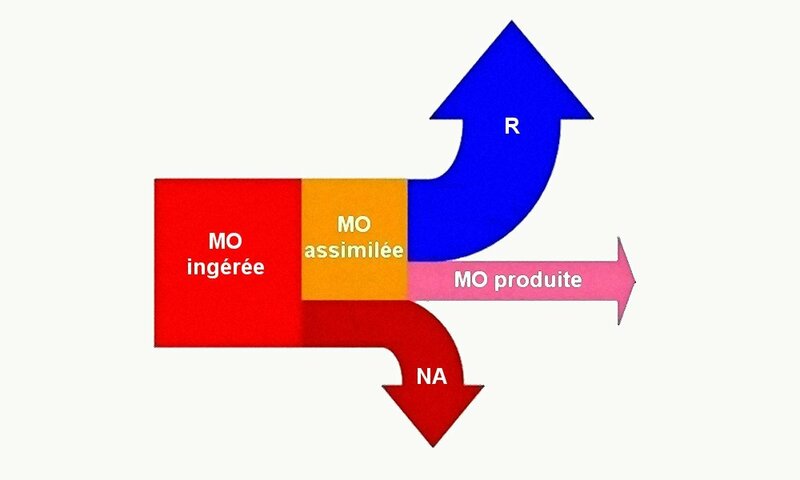 From a French educational website talking about agricultural practice and environmental management (‘Pratiques agricoles et gestion de l’environnement’) this small distribution Sankey diagram.